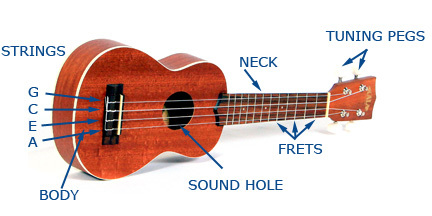 The ukulele is a member of the lute family of instruments. It was developed from a small guitar brought to Hawaii by the Portuguese in the late 1800's. It is mainly used to accompany folk and popular singing. The concert size is lightly and louder with a deeper tone. The tenor has more volume and a deeper bass tone. If you would like to learn more about the strings and tuning pegs, click here.